Clarice Law, D.M.D., M.S. is an assistant professor in the Sections of Pediatric Dentistry and Orthodontics in the Division of Associated Clinical Specialties at the UCLA School of Dentistry. Dr. Law is the acting chair of Pediatric Dentistry. She received her dental degree from Harvard School of Dental Medicine, then spent a year conducting research in developmental molecular biology at the Forsyth Institute in Boston, MA. This led her to pursue dual specialization in pediatric dentistry and orthodontics at UCLA’s unique combined residency program while concurrently conducting research leading toward an M.S. in Oral Biology. 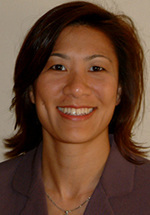 Dr Law then practiced in both specialties for two years before returning to the UCLA School of Dentistry for a faculty position. Most recently, she was selected to participate in the Fellowship in Medical Education offered through the David Geffen School of Medicine at UCLA. Dr Law’s initial research focused on understanding the growth and development of the craniofacial complex and the resulting jaw positions. However, given her increasing involvement in curriculum design and recent participation in a Medical Education Fellowship, Dr Law’s research interests have shifted toward educational research. 1. Law, CS. (2007). "The Impact of Changing Parenting Styles on the Advancement of Pediatric Oral Health " Journal of the California Dental Association 25(2): 192-197.